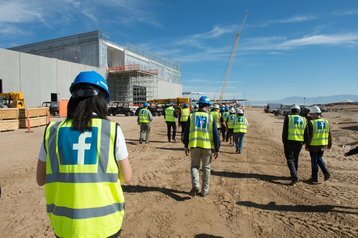 As Facebook’s $1bn data center expansion in Los Lunas steams ahead, a joint venture established by several New Mexico utilities is planning to build two 50MW solar farms to power the facility. NM Renewable Development (NMRD), made up of subsidiaries of American Electric Power and local provider PNM Resources, said the generation plants will represent a total investment of $70m. They will be built one at a time; the first is expected to be operational at the end of next year, while the second is planned for June 2020. Including these latest solar farms, Facebook will have invested more than $800m in local solar and wind power generation, totaling 396MW of capacity. The social media giant has pledged to run all of its data centers on renewable energy by 2020, after hitting the 50 percent mark last year. Hyperscalers like Apple and Google have already achieved this goal, though they largely relied on existing renewable infrastructure, whereas Facebook has invested in new projects: in the past year alone, the company has signed contracts amounting to more than 2.5 gigawatts of new solar and wind energy, lending weight to the idea that hyperscalers may in fact drive renewable energy generation. Pat Vincent-Collawn, chairman, president and CEO of PNM Resources, said that "opportunities for solar energy are abundant in New Mexico, and Facebook's growth allows us to demonstrate our commitment to making our state a sustainable energy leader." "We are proud to support Facebook's presence in New Mexico." Facebook broke ground on the expansion last year – despite not having yet finished building the first block of the original campus – with work on the site expected to continue into 2023. In exchange for its investment, local and state authorities offered the company a thirty year property tax break, $1.6m in annual tax reimbursements and $13m in funding for local development and job development. The hefty incentives were the state of New Mexico’s way of stopping Facebook from building the facility in Utah – which it was considering as an alternative.